Reading time – 3:51; Viewing time – 6:13 . . . This is the sad tale of The Spineless Ones, those who simply cannot stand up for what they know to be right and instead selfishly cave in to others, whom they allow to be far too influential in their careers. The members of the House voted 235-180 and the Senate voted 57-43 to eliminate the prohibition of mentally unstable people from being able to purchase firearms. Essentially, they’ve said that your sociopathic Uncle Alfonse, who is mentally unable to care for himself and has violent hallucinations, may now own an arsenal of guns and ammunition. The repeal of the prohibition was spearheaded in the Senate by Senator Chuck Grassley (R-IA). He is the same Chuck Grassley who fought Obamacare with the stirring words of a warrior for truth and integrity, saying, “They’re going to pull the plug on Granny.” He declared that lie as part of the Republican brain dead opposition to anything Obama, this episode of which was a fight against non-existent “death panels” he insisted were built into the Affordable Care Act. In this week’s victory for more homicides, his next act of courage, Grassley declared that the prohibition against the ownership of guns by the mentally disabled unfairly stigmatizes these people. UNFAIRLY STIGMATIZES THESE PEOPLE! Is this nonsense making your eyes go all googly? Does Grassley’s Orwellian logic of people who are mentally disabled being stigmatized because they can’t own a Bushmaster assault rifle mash up your brain cells? It should. This is yet another case of big money lobbying distorting our rights, our freedom, our safety and our common sense. It is exactly why I deliver keynotes entitled, Money, Politics and Democracy: You Aren’t Getting What You Want (here’s a link to a 15-minute sample video). If we don’t fix this, the next time you walk past your neighbor’s door you may be greeted by that poor soul who suffers from dementia but has in his hands a Glock semi-automatic fitted with a silencer. He might not shoot you then, but he’ll still be next door tonight – with his gun. Sleep well. And get me booked to present to your group before Grassley and the other Spineless Ones do yet more damage to America. President Trump’s press conference of February 16 was yet another supreme exhibition of self-congratulation and self-admiration, reaffirming multiple times what the electoral college count was and how awful Hillary is, and an unrelenting attack on the press, supported by absolutely no specifics or facts. That is to say, it was standard Trump and added very little to our political or governmental knowledge. What he did say was that in talking with the Russians after the election and before the inauguration, Michael Flynn was doing his job. Trump said that he did not direct Flynn to talk with them about the easing of sanctions, but that he would have, had he given Flynn marching orders. Just to be clear, Flynn’s advising the Russians about Trump lifting sanctions once in office, this done while President Obama was still in office, was and is an illegal act, arguably treason. And President Trump tells us that he would have advised Flynn to do that very thing. I’m past asking questions, like why would Trump do such a thing or even say such a thing, because his why doesn’t matter. What does matter is that he has once more demonstrated his complete lack of respect for the law. What do you think we the people should do about that? We’ll be watching to see how The Spineless Ones deal with the apparent treason that has rocked our democracy. Do they have what it takes to stand up for what they know is right, or will they cave in yet again, this time to an infant tyrant’s delusions of grandeur and lawlessness? Watch this space. 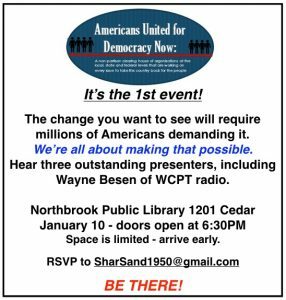 Finally, I just returned from a town hall meeting with Rep. Brad Schneider (D-IL 10th). Hundreds of highly energized citizens packed every meeting room in the library to capacity and he stayed overtime to answer questions. Does your representative show up for town halls and answer questions? Does your representative both enter and exit using the front door, or is s/he weaseling out the back so they don’t have to face you? Key point: Rep. Schneider made it clear that his focus is to uphold the oath he took to protect and defend the Constitution, not partisan extremism. Can your representative say the same thing? 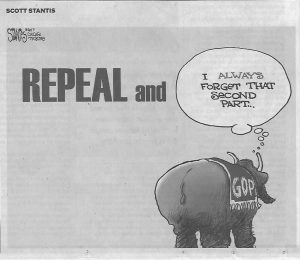 Or is s/he a tool of their party, one of The Spineless Ones? Reading time – 1:46; Viewing time – 3:20 . . .
June 9, 1954 was a remarkable day in American history. Alcoholic, lying Sen. Joseph McCarthy (R-WI) had taken center stage in 1950 when he spoke for five hours on the floor of the Senate, making wild accusations of communists in the State Department and denigrating homosexuals. He used his position as chairman of the Senate Permanent Subcommittee on Investigations to make yet more wild, unsubstantiated claims that eventually ruined the lives of countless innocent Americans. 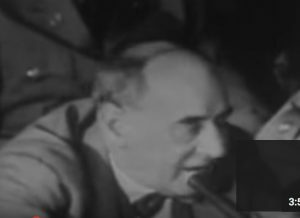 On that June date, though, Joseph Welch, chief counsel to the U.S. Army, which was under investigation by McCarthy’s sub-committee for supposed communist ties, called out McCarthy with words that instantly became memorable for their truth-to-power courage. “Have you no sense of decency, sir? At long last, have you left no sense of decency?” Watch it here on YouTube at roughly 1:12 of the clip. We’re living now with another tyrant who uses the same tactics. He has already hurt many people and is in the process of hurting many more. The blue collar Americans he promised to help are and will be ignored by the billionaire buddies in his cabinet. The laws and regulations we’ve put in place over the years to protect us from the harm caused by bullying, shortsightedness, excessive greed and impropriety are already being swept away. He is attempting to crush the Constitution under his gold plated heel and put our future at risk, so that we will once again be subject to the failings of the past. Had I the opportunity, I would ask President Trump, “Have you no sense of decency, sir?” but I already know the answer. So do you. So, here’s a question to ponder: Why does Donald Trump hate America and Americans? Taken one step further, why does Donald Trump hate babies and people who are suffering? Why is he so ready to hate anyone? Whatever the answers, they impact you. Have a look at Keith Olbermann’s 3-minute piece on that. Reading time 3:29; Viewing time – 6:07 . . . He trundled out his list of astonishingly unqualified candidates for cabinet posts, at least three of whom have previously vowed to eliminate the agencies they would now oversee. His chief strategist is a white supremacist, alt-right bigot and Trump has put him on the National Security Council. * He announced his National Security Advisor pick, a former general who is extreme enough to have been forced to resign from the Defense Intelligence Agency and who is foolish enough to have habitually retweeted insane stuff. He put a gag rule on multiple agencies of government and fired both the acting Attorney General and the Acting Director of Immigration Enforcement. Then the Muslim ban was announced and we showed up at airports by the thousands in solidarity with refugees and immigrants. Lawyers toted their laptops to airports and gave free help to those stuck there. No way we’ll stand for crushing a Presidential heel into the face of the Statue of Liberty. Trump’s Supreme Court justice nominee is so far to the right that when he was in high school he joked about founding a club called “Fascism Forever,” although The Daily Mail claims he really did it. That’s a keenly important attitude for a megalomaniac president’s Supreme Court justice, but not so much for the rest of us. 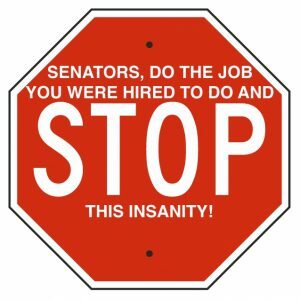 It’s time to stiffen senatorial spines – call your senators and tell them. And let’s not forget that Trump’s Secretary of State is great buddies with our sworn enemy, Vladimir Putin, who is stepping up military aggression in the Ukraine. At the same time Trump is removing sanctions on Russia. And Trump has already insulted the leaders of at least four of our allies, Mexico, Australia, Germany and Canada. We’re distracted by the blizzard of substantial issues pouring from the White House, none of which appears to have been thought through but which, in the aggregate, keep us engaged in a frenetic readjustment of our focus. So, we miss the political coup that’s underway, and that is the real deal, and it’s incrementally happening by keeping us distracted. The open door to the coup is the next misdirection and it is going to have global consequences for decades. On February 1 National Security Advisor Mike Flynn came to the White House daily briefing and made a belligerent threat to Iran in the wake of their having tested a ballistic missile. He put the Iranian government “on notice.” That doesn’t leave much room for the U.S. to maneuver if the Iranians launch another missile. That’s exacerbated by President Trump having fired nearly all of our State Department staff, all the way down to those who issue visas. Those now gone were the folks in charge of diplomacy, which, as you’ll recall, is what we formerly used to avoid war. Here’s an historical reference. George W. Bush came to the White House determined to take down Saddam Hussein. Whether that was because that dirty varmint said something bad about Bush’s daddy or because he just figured Saddam was too bad to stay in power or whether he thought he could remake the middle-east in the democratic image of America, we likely will never know. What we do know is that he seized upon the tragedy of 9/11 and blamed Saddam, saying he was in cahoots with al-Qaeda (which was nonsense, because al-Qaeda is fanatically religious and Saddam was secular and seen by al-Qaeda as apostate) and he also told us that Saddam had weapons of mass destruction, all evidence to the contrary be damned. The point is that Bush lied. He manufactured reasons to start a war and it had nothing to do with our national security. And we’re seeing Trump do that same thing right now. Clearly, we don’t want Iran to have either ballistic missile or nuclear weapon technology. 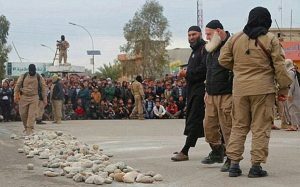 This has to be dealt with, but leaving ourselves no tools but military action assures more war with no way out. And Flynn having immediately gone public with a threat that sounds a lot like a schoolyard taunt, leaves the Iranians no way to back down while saving face. Alternatives to war have all but vanished. This is all complicated by our president being incapable of reassessing or admitting he made a mistake or acknowledging that he is anything but infallible and the smartest person (“I’m speaking to myself about foreign policy, because I have a very smart brain“). Just remember that he told us that he knows more than the generals. And our judges. And the climate scientists. And all our diplomats. And all our negotiators. And all our education experts. Call him the god-like Kim Jong-Trump. Trump is edging us to the precipice of another war that has nothing to do with our national security. The war dead will stay dead and real people will grieve and we will stay mired in the death and destruction and debt. 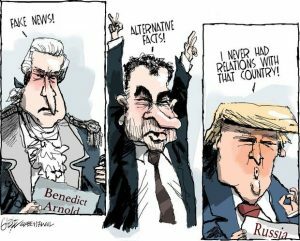 And Trump has his reason. He will use our mass protests against war – and yes, we will protest – as sufficient reason to declare martial law. All of this – the discrimination, the dismantling of our governmental institutions, gag rules and firings, stealing the Supreme Court, the insulting of our allies and giving relief to our avowed enemy and the coming war itself – all these distractions exist so that this President can become the American dictator. Then the coup will be complete and our democracy will be over. Click here for more. Thanks to PV for the pointer. Here’s Robert Reich with the imperative. Some of the misdirection is subtle. Here’s the Washington Post’s Why Trump’s focus on ‘Islamic terrorism’ misses the point entirely and why it will lead to truncated freedom of the press. Reading time – 2:03; Viewing time – 4:09 . . .
Opinion: That sounds a great deal like a lightly veiled threat to freedom of the press and has an Orwellian thought police stink to it. Opinion: That’s a most interesting take on truth, this from the Chairman of the House Science, Space and Technology Committee who denies climate warming (also here) and really isn’t much for science at all. Perhaps he, too, saw the biggest crowds ever on Inauguration Day. Fact #3: On Holocaust Remembrance Day, President Trump issued a statement that failed to mention Jews or antisemitism (also here), even though in the Holocaust Jews were specifically targeted for extermination. This was the first such Presidential omission. Opinion: Blowing off the recognizing of the murder of six million people, all of the same religion . . . an anti-Semite with the President’s ear . . . what could that mean? Opinion: During his campaign for the Presidency Donald Trump promised repeatedly that one of the first things he would do as President would be to ban all Muslims from entering the United States. Attempting such a thing would immediately fail for being in violation of the First Amendment of the Constitution, so Trump is using this subterfuge to effect religious discrimination. Let’s connect the dots. First we’re told to shut up. Then we’re told to get our information only from the President. Then the President snubs Jews and bans Muslims. This is looking very much like the beginning of making the United States an officially white, Christian nation with discrimination, subjugation and humiliation for all others. These dots make a horrific picture. Using the duck metaphor, if connecting the dots makes a picture that looks like a duck and we then find that it walks like a duck and also quacks like a duck, it’s probably a duck. But this duck is full of hate. 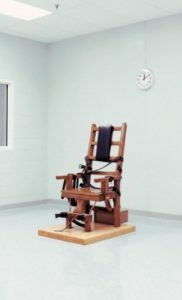 If you’re up to it, have a look at this post that presents a fair assessment of what is really going on and the grave danger that may be on the way. History tells us that there is something to this. Thanks to SL for pointing me to the blog. ALTERNATIVE FACTS UPDATE: Following a weekend of impassioned protests at airports across the nation last weekend against President Trump’s Executive Order effectively banning Muslims from entering the United States, Trump blamed airport delays first on Delta Airlines’ computer problems and also blamed Sen. Chuck Schumer’s (D-NY) tears. In a statement issued this morning, Sen. Schumer’s tears have denied responsibility for any airport delays and suggested that Mr. Trump couldn’t find reality with two hands and a flashlight. Trump’s tweets have been scored BIGLY ALTERNATIVE on the Alternative Facts Meter. Kellyanne Conway, official advisor to the President, is reportedly pleased and is said to be smiling, as well as continuing to talk constantly, but without addressing any question posed to her. Reading time – 1:29 seconds; Viewing time – 2:31 . . .
See indented paragraph below for instructions. So says Dr. Lee Thayer, an expert in the fields of leadership and communication. He has much to teach those who would lead, especially those who would consciously lead their own lives. That necessarily translates to leading organizations and even countries. The point here is about how we lead our lives in the face of what appears to be very dangerous. The radical right has pursued an extremist agenda for decades and it has infiltrated all aspects of American life. It has its claws in education, in radio and television, in energy, in the halls of Congress, and now a radical has assembled a vigilante group of moneyed extremists to run the executive branch of government. It’s enough to spin any centrist in circles. Worse, it makes solutions look overwhelming and unattractive enough to freeze people into inertia. So, the first step is decide to move. It’s hard for anyone to leave the ease and familiarity of our comfort zones to confront those who would oppress. It’s far easier to give in to believing that the problem cannot be solved than to take action on the solution we don’t like because of the very hard work that will be required. And yet that is what we must do. We do not have the luxury of simply sitting on the sofa and complaining about what is so very wrong and cannot be fixed. We cannot just hurl curses at what we imagine we are powerless to change, because the consequences of only hurling those curses may be catastrophic. If we squint our eyes we will see that the solutions really are preferable to believing this is a problem we can’t solve. Start with this. 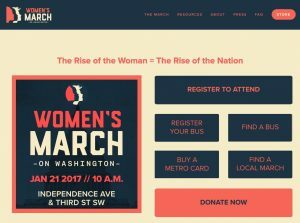 Go to www.WomensMarch.com, click on the “The March” tab at the top, then “Sister Marches” in the dropdown to find a march in your city – there are marches all over the country. Then bring 5 people with you to the march on January 21. You don’t have to be a woman to attend. All that’s required is to have had a mother – that includes most of us. This is about everybody’s rights. It isn’t enough to simply believe. You have to stand up. Because this isn’t a problem you can’t solve. The solution is to stand up for what you believe in. Prefer that! I’ll be looking for you at The March on the 21st. Reading time – 2:54 . . .
An email addressed to our family from my travel writer, Montana native, daughter-in-law Wendy arrived and it was so shocking and important that I asked permission to post it here as a guest essay. You may know what’s going on in Whitefish, MT, but it’s unlikely that you’ve heard about it on such a personal level. Read on. It’s important. This terrifies me to my core, especially because I was born and raised in Montana and I feel so bad for the open minded and openhearted majority of Montana locals who are dealing with this. The scary thing is that this dirt bag, emboldened by Trump, has decided to run as an Independent and already has a platform: Montana First. Isn’t this what most of us feared with a Trump presidency? The trolls are coming out from under the bridges and are showing themselves. It’s up to us to support and become activists for what’s right. Missoula, MT (the biggest town near Whitefish) has started a “Light in Every Window” campaign and I think everyone, Jews or not, should stand up and show solidarity, across the nation by putting menorahs in our windows. Also, visit the Love Lives Here in the Flathead Valley site to show support for the Whitefish locals. And, if you think that what happens in one small town in northwest Montana doesn’t affect you, you’re wrong—this hate mongering is happening everywhere and it’s growing. We need to stand up for our brothers and sisters who are being discriminated against. I’m so disturbed and sad. The hate groups are growing exponentially and I really feel like non-Jews and non-people-of-color need to stand up and SHOUT, “THIS IS NOT OK.” Whitefish has known about Spencer for years and they’ve stayed quiet until Spencer grew emboldened by Trump and became louder. Now, this little picturesque town is getting torn apart by the attention and association with this dirt bag. I’m proud of the people I know who live there and of this little town that could, but I fear that it will harm them beyond repair. I also feel like my job of visiting and writing with the purpose of tourism is more important now than ever. The majority of Whitefish residents don’t feel this way [like Spencer]. The majority believes in love and diversity and community. My pal Brian Muldoon is an attorney and mediator living in Whitefish and he keeps his finger on the pulse of the town, so I asked for his comments about what is happening there. He wrote, “And the people of Whitefish are NOT deeply divided about this, as some media have reported. It’s Richard Spencer v. Everyone Else.” That’s reassuring. What is not as reassuring is that, as Brian notes, it’s very hard to shut down the trolls and the haters, in part because they have a First Amendment right to spew their hatred – plus, they revel in the publicity. It’s important that you understand that this is not just an intellectual, “Oh, that’s interesting” exercise. Brian just advised that the FBI has sent one Whitefish family into hiding. They only do that when there are credible death threats. Hatred has consequences. For some valuable context, read Brian’s short essay, Why Racism Matters – just click the title to download the PDF. Do you imagine this is an isolated case of hatred? It isn’t. Here’s yet another independent, ongoing tally of hate crimes, with the Whitefish situation detailed second on the list. This is not about what Trump might do the the departments of energy, EPA, Social Security or Medicare. This is about our national security. The Founders created the Electoral College for several reasons, but the most important was to ensure there would never be any interference by a foreign agent, government or institution that might compromise our republic. Here’s a link to what Alexander Hamilton had to say about this in Federalist 68. It’s short, clear and exceptionally compelling. Read it. Hillary Clinton won the popular vote by almost 3 million more votes than Donald Trump. Trump won the electoral vote by less than 80,000 votes combined in Michigan, Pennsylvania, and Wisconsin, where Republicans went to great lengths to block recount efforts. Based on the facts, it is beyond a reasonable doubt that Russia influenced the 2016 U.S. election which helped Trump win the White House. Trump’s consistent refusal to admit Russia’s involvement, especially given his access to highly classified information, demonstrates he is either unreasonable and possibly of unsound mind or he is aiding and abetting Putin. This is a national security issue that the Electoral College must take seriously when casting their votes on Monday. In the meantime, it is imperative that a thorough investigation is conducted as to the extent of Russia’s operation, and that this information pertaining it be released to the public. The net of this is that you MUST contact the Electors and urge them not to vote for Trump. 20 GOP electors have already indicated that they will not (watch this video and listen to what one elector has to say) – we need 17 more. Here’s how to make that happen. Bruce Mainzer has compiled all you have to know/do into the text below. I’ve pasted his work below. Just follow the bouncing ball and you will have done your part – except for this last piece. Forward this post to everyone you know and urge them to take action RIGHT NOW. Our national security and our safety in the world may hang in the balance. Don’t put it off until later when everyday activities might distract you. Do this now. As promised here is information about the Electoral College. Please email this to everyone tonight as Monday Dec. 19th is fast approaching for the date of the Electoral College vote. As I mentioned in the meeting, Laurence Lessig, Harvard Professor of Constitutional law, is reporting that 20 GOP Electors have already told him in confidence that they will not be voting for Trump. It takes only 17 more GOP Electors to defect, and Trump does not get the 272 Electoral College votes necessary for being President Elect. Everyone should therefore be writing the electors, and they can use the information on this email. What looked like a long shot last week is now a distinct possibility. First, here is my email to Electors, but everyone should feel free to write their own version. My letter focuses on the possibility that Donald Trump will not act in the interest of the United States foreign policy, which Alexander Hamilton stated was one of the conditions that the Electoral College would be justified in not voting for a candidate. Hamilton also was concerned with a demagogue being nominated, so that is another reason that someone can state their objection to a candidate. My name is _________ from CITY NAME, STATE. It is becoming quite apparent that Donald Trump is in collusion with President Vladimir Putin of the Russian Federation to hijack the foreign policy of the United States and enrich himself and others. One need not investigate the election tampering issue, but instead view the plethora of statements and actions taken by the candidate. These actions have included selection of an NSA director Michael Flynn with known ties to Russia (paid consultant to the Russia Tonight news cable network) and selection of ExxonMobile CEO Rex Tillerson for Secretary of State, who violated existing U.S. policy to meet and conduct business with Vladimir Putin over the past few years. Carter Paige, former campaign aide, met with Russian financial interests and reportedly promised lifting of sanctions in Moscow last summer. Paul Manafort, former campaign manager, was a paid consultant for Putin ally and deposed Ukrainian leader, and now Mr. Manafort is reportedly is still serving as an unofficial adviser to the transition team of the President Elect. Trump positions on sanctions and relationships with NATO and protection of the Balkan states from Russian aggression are at direct odds with 40 years of current U.S. foreign policy. Because Mr. Trump has not released any financial information or tax returns, we are left to speculate as to the motivations of this President Elect. For many years, Mr. Trump had received financing from Russian oligarchs when credit was unavailable to him in the US. In addition, Trump has sold quite a bit of luxury real estate to Russian individuals in Panama, Florida and other locations. Reports of debt that Mr. Trump has to individuals or institutions in Russia have been estimated at approximately $500 million. We do know the motivations of Vladimir Putin. While there is evidence that Putin did not believe that Trump would be elected despite the Russian interference in the campaign, now that he has been elected, there is a definite attempt to achieve a number of goals with this incoming President. Lifting of the sanctions will allow Russia to finally execute its stalled deal with ExxonMobile to drill in the arctic. Revenues from this almost $7 trillion dollar oil reserves (15% of the known reserves in the world), will do much to rescue the Russian economy. It has been estimated that these oil reserves will represent 2/3rds of all exports of Russia. ExxonMobile also stands to make billions of dollars from this one deal, and obviously enrich the current CEO and nominated Secretary of State. This new Russia US rapprochement already has had disastrous consequences for innocents across the globe as Russia’s latest inhumane attacks in Aleppo Syria were undertaken a day after a congratulatory phone call between Putin and the President Elect. Russia has been accused of similar election interference in the Ukraine and Sweden. Currently, there is speculation that election tampering by Russia is underway in Germany. The issue for the Electoral College is therefore not whether or not Russian interference affected the election results. Instead, the issue that needs to be investigated is whether or not Donald J. Trump as President will act in the interests of the United States or if he is a foreign agent acting on behalf of Russia and will implement a corrupt administration to enrich himself and reward the Russian government. The preponderance of circumstantial evidence is considerable. Even without a full financial disclosure from the President Elect, it would be a violation of the responsibilities of the Electoral College as stated in Federalist Paper 68 to elect Donald J. Trump as President due to the already known facts about his positions and selections of individuals for his administration. I urge the Electoral College to at least postpone their vote until after all financial records of Donald J. Trump are disclosed. If the President Elect refuses to release all his financial information, I believe the Electoral College has every right to not vote for Donald J. Trump since it is clear that he is a danger to all citizens across the globe and cannot be the President of the United States. Thank you for your time and consideration. I appreciate and respect the role you serve in our electoral process. To email the electors, I have provided a list below.